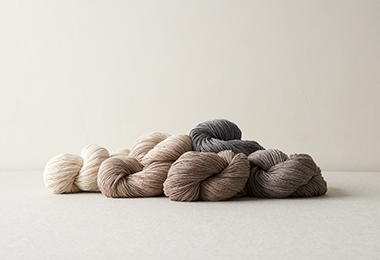 Modern and minimal, earthy and sumptuous, the free pattern for our Sand Drift Blanket spans all six shades of our undyed organic cotton and alpaca Sweetgrass yarn. It may look like seed stitch, but you actually make this blanket without the trouble of purling (yup!). Holding two strands of yarn, you just work a very simple slip stitch pattern, alternating colors every third row. 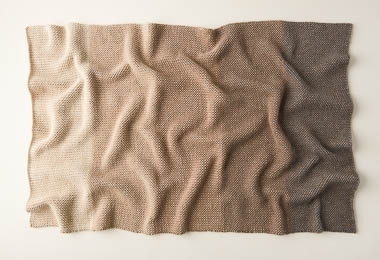 Doubled yarn and a super-tactile texture, the warm landscape of the Sand Drift Blanket has an incredibly satisfying weight and heft. Plus, the full tour of the Sweetgrass spectrum lends a barefoot-on-the-beach kind of pleasure... We love the study in nature, the celebration of subtlety, and the beauty of undyed fiber! Click Product Details, above, for more information.